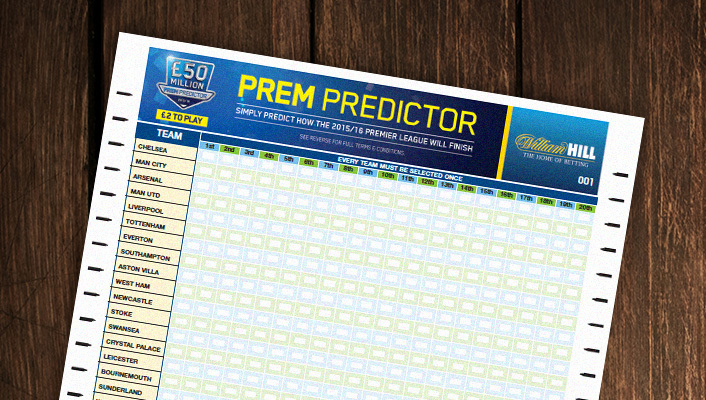 By correctly predicting the final positions of all 20 Premier League clubs in the 2015/16 season, £50 million can be won. Notice: Entries are now closed. Not only are we giving customers the chance to win £50 million, the customer(s) who is leading the competition at the Christmas period with the most accurate selections will win £100k. If there is more than one successful entry, then the prize will be shared equally between all successful entries. If there is more than one successful entry at the end of the season, the £50 million prize will be shared equally between all successful entries. In the event that there is no successful entry and therefore no-one wins the £50 million, a consolation prize fund of £100,000 shall be made available by William Hill. Maximum of 250 entries per customer whether through the website, app or the shops or a combination of these. In-Shop - To find your nearest shop, visit our shop locator. You cannot take for granted any in-game score in this league. Any team can score goals in the last minutes of the game and I like that.